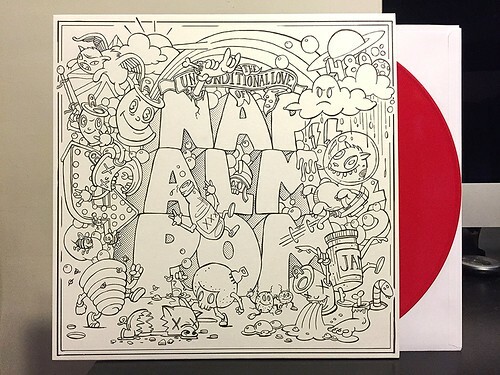 I picked up this Napalmpom record at the recommendation of a friend. I didn't check out any of the songs prior to ordering, I just took a blind leap. I can't say the album was exactly what I was expecting. I wouldn't call it bad and I wouldn't call it great, all I can really say is the band is playing a style of rock and roll that's just not my favorite. Napalmpom are a rock and roll band, very much in the traditional late 70'sand 80's version of the term. The songs are poppy enough where I enjoy them, but they tend to go a little further into a glammy, lead guitar driven direction that isn't my thing as much. If you like Thin Lizzy or maybe T. Tex or if you really love "Jump" or "Panama" by Van Halen, this is probably the album for you. Napalmpom are all about on huge guitars, backing vocals and making the sort of music where I assume the guitar player jumps up in the air and kicks from time to time. They do this style of music very well, but it's the kind of thing I really have to be in the mood for to listen to. A big plus is that the artwork is super cool and the record also came with a set of colored pens so you can color the cover yourself. I may actually do that while I'm off from work next week. That's going to wrap up 2014 for me as far as new reviews go. I've been able to knock out just about every full length that came out in 2014 that I bought. On Monday I'll be posting my Absolute Best Records of 2014 list, and Then I'll be hibernating for the rest of the week. When I come back, I have a ton of reissues to get to that I've been putting off, so there's never a shortage of things to write about.